Getting dental implants is a long process, which typically takes 4 to 6 months. First, you have to have your permanent tooth or teeth extracted. Next, Monrovia dentist Dr. Q will make temporary restorations of your teeth, so you don’t have to walk around toothless during your dental implants process. You will then be referred to a trusted dental implant surgeon to place the dental implants in, and the temporary teeth will be placed on your implants. 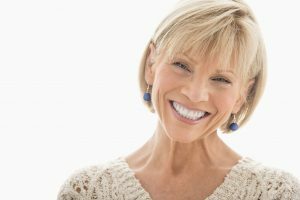 Likely, around two weeks after your dental implants are placed, your oral surgeon will want to see you to make sure that osseointegration is complete, meaning that the jawbone has attached itself securely to the implant and is growing around it completely. He or she may also want to check in with you on a frequent basis to make sure that you are healing properly from the dental implant procedure. If you are experiencing any complications from your dental implants, you should make an appointment with your oral surgeon immediately. Finally, at the end of the process, your permanent crowns – or teeth – will be placed on your implants, and you will be released back into the care of Monrovia dentist Dr. Q. Once you have been cleared by your oral surgeon who placed your implants and permanent teeth, you will want to visit Monrovia dentist Dr. Q for your regular 6-month check-ups. So that your dental hygienist can clean them properly, make sure you mention that you have dental implants. Floss your teeth once a day, before your brush them. To floss properly, gently glide the floss between your two teeth, and then use a “C” motion to reach the area that is between your two teeth. And remember to floss the backside of your last 4 molars, where plaque can still build up. If you notice your gums bleeding after you floss, that isn’t a sign that you should stop flossing. Typically, bleeding gums mean you need to floss more often, though perhaps with a more gentle touch. Brush your teeth twice a day for 2 minutes at a time, with fluoride toothpaste. Use a toothbrush with soft bristles and a soft grip. While brushing, gently use short back and forth strokes to brush the front, back and chewing surfaces of your teeth. And don’t forget to brush the backside of your 4 back molars. I Have More Questions About Dental Implants. Who Should I Contact? If you have more questions about dental implants, contact Dr. Q and her knowledgeable team at her Monrovia office today at (626) 599-9819.